The recent emergence of extensively multidrug-resistant Mycobacterium tuberculosis strains has further complicated the control of tuberculosis. There is an urgent need for the development of new molecular candidates antitubercular drugs. Medicinal plants have been an excellent source of leads for the development of drugs. The aim of this study was to evaluate the in vitro activity of 28 alcoholic extracts and essential oils of native and exotic Brazilian plants against Mycobacterium tuberculosis and to further study these extracts through chemical fractionation, the isolation of their constituents, and an evaluation of the in vivo acute toxicity of the active extracts. To the best of our knowledge this is the first chemical characterization, antituberculosis activity and acute toxicity evaluation of Annona sylvatica. The anti-mycobacterial activity of these extracts and their constituent compounds was evaluated using the resazurin reduction microtiter assay (REMA). To investigate the acute toxicity of these extracts in vivo, female Swiss mice were treated with the extracts at doses of 500, 1000 and 2000 mg · kg-1 of body weight. The extracts were characterized by LC-MS, and the constituents were isolated and identified by chromatographic analysis of spectroscopic data. Of the 28 extracts, the methanol extract obtained from the leaves of Annona sylvatica showed anti-mycobacterial activity with an minimal inhibitory concentration (MIC) of 184.33 μg/mL, and the ethyl acetate fraction (EAF) resulting from liquid-liquid partitioning of the A. sylvatica extract showed an MIC of 115.2 μg/mL. The characterization of this extract by LC-MS identified flavonoids and acetogenins as its main constituents. The phytochemical study of the A. sylvatica EAF resulted in the isolation of quercetin, luteolin, and almunequin. Among the compounds isolated from the EAF, luteolin and almunequin were the most promising, with MICs of 236.8 μg/mL (827.28 μM) and 209.9 μg/mL (328.48 μM), respectively. The acute administration of the EAF fraction in doses of 500, 1000, and 2000 mg · kg-1 of body weight did not cause signs of toxicity in the treated animals. Tuberculosis remains an important public health problem and a major cause of death worldwide; it is responsible for approximately one million deaths every year[1, 2]. Due to the reduced effectiveness of current drugs resulting from the emergence of multidrug-resistant strains (MDRTB) and co-infection with HIV, there is an urgent need to develop new natural or synthetic antitubercular drugs[3–5]. The use of medicinal plants is important throughout the world, especially in traditional or alternative medicine. The search for active plant-derived compounds is a modern approach to drug discovery, especially in tropical regions with abundant flora. In underdeveloped or developing countries, medicines derived from plants are important weapons against serious diseases. Traditional medicine has enabled the treatment of common illnesses in approximately 60 to 80% of the world population[6, 7]. The extraction of compounds from plants and the testing of the biological activity of those extracts and/or compounds represent the first steps toward identifying natural products or semi-synthetic derivatives that may provide new antitubercular drugs[8–12]. Research in the area of natural products has intensified, especially in the search for compounds and plant species that are active against Mycobacterium tuberculosis and with the development of easier, faster, and safer screening techniques[13–26]. Previous studies have demonstrated that several plants are active against M. tuberculosis, such as Clavija procera B. Ståhl, which has been shown to be active even against resistant strains; Abelmoschus esculentus Moench; Faurea saligna Harv; Parinari curatellifolia Planch ex Benth; Maerua edulis (Gilg & Gilg-Ben.) DeWolf; Securidaca longepedunculata Fres. ; Tabernaemontana elegans Stapf; Zanthoxylum capense (Thunb.) Harv. ; Aristolochia taliscana Hook; and Acorus calamus L. var. americanus. According to the screening program for new antitubercular drugs developed by the National Institutes of Health of the United States, all compounds must be used in both in vitro and in vivo models to evaluate their potential as antitubercular agents. This study was conducted as a preliminary in vitro screening of 28 plant extracts and three essential oils against M. tuberculosis using the REMA assay. 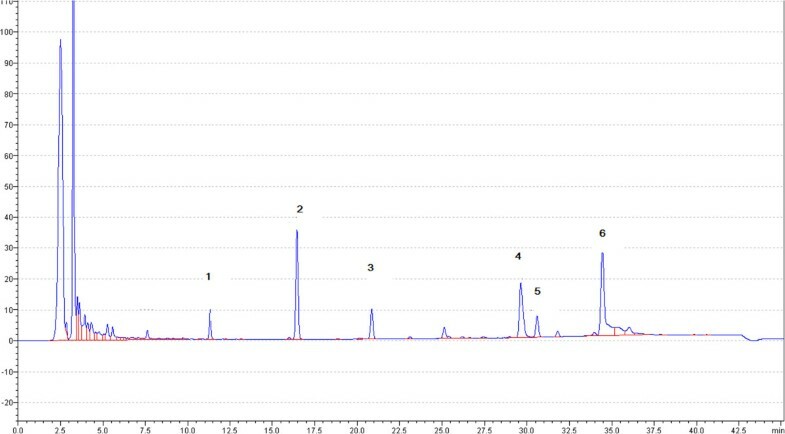 The characterization of the active extract by LC-MS, the isolation of the main constituents of this extract, and the subsequent evaluation of the anti-M. tuberculosis activity and in vivo acute toxicity of these extracts were also performed. Different species of Asteraceae, Anacardiaceae, Annonaceae, Bignoniaceae, Euphorbiaceae, Fabaceae, Gesneriaceae, Malvaceae, Meliaceae, Myrtaceae, Rubiaceae, Sapindaceae, and Tropaeolaceae were collected in Dourados, Mato Grosso do Sul, and Maringá and Curitiba, Paraná, Brazil. The plants were identified by Dr. Armando Carlos Cervi, Dr. Maria Conceição de Souza, and Dr. Zefa Valdevina Pereira. A voucher specimen of each species was identified and deposited in the herbarium of each institution (Table 1). a.Herbarium of the Universidade Federal do Paraná – UFPR. b.Herbarium of the Faculdade de Ciências Biológicas e Ambientais – UFGD/MS. c.Herbarium of the Departamento de Biologia – UEM/PR. d.Herbarium of the Museu Botânico Municipal de Curitiba - PR. L = leaves; R = root (wood + bark); S = stem (wood + bark); C = capitulum; F = fruit. Solvents: h, hexane; hs, 90% hydroethanolic solution; m, methanol; e, ethanol. The plants were air-dried at room temperature and ground with a pestle and mortar. Approximately 300 g of each sample was then exhaustively extracted by macerating the sample with 1.5 L of the appropriate solvents (Table 1) at room temperature (five times for each species at 48 h intervals). The crude extract was then isolated by the evaporation of the solvent under vacuum on a rotary evaporator. For subsequent studies, the extracts were diluted in DMSO (dimethyl sulfoxide) at 10,000 μg/mL. An extract that exhibited potential activity against Mycobacterium tuberculosis was dissolved in methanol:water (1:1) and partitioned with chloroform and ethyl acetate to yield the chloroform fraction (CF), ethyl acetate fraction (EAF), and hydromethanol fraction (HMF) after the evaporation of the solvents on a rotary evaporator. The resulting EAF (2.3 g) was applied to a chromatographic column on silica gel 60 (0.063-0.200 mm) (70–230 mesh) and silica flash (35-75 μm) (220–440 mesh) and eluted with a mixture of chloroform:methanol in increasing polarity, yielding 54 fractions of 10 mL each. After a thin-layer chromatography (TLC) comparison, the fractions with similar TLC patterns were grouped into ten sub-fractions. Sub-fraction 5 (173 mg) was fractionated on a Sephadex LH-20 column using H2O, H2O:MeOH 1:1, and MeOH; this process yielded two known flavonoids (6.5 mg and 5.8 mg). A series of experiments was conducted to isolate the acetogenin. Sub-fraction 8 (126 mg) was purified by flash chromatography on silica gel 60 (0.063-0.200 mm) (70–230 mesh) and silica flash (35-75 μm) (220–440 mesh) to yield almunequin (8.4 mg). Quercetin 1H NMR (300 MHz, CD3OD) δ ppm: 7.65 (1H, d, J = 1.8 Hz), 7.00 (1H, d, J = 8.9; 2.0 Hz), 6.9 (1H, d, J = 8.9 Hz), 6.43 (1H, d, J = 2.1 Hz), 6.20 (1H, d, J = 2.1 Hz). 13C NMR (75.5 MHz, CD3OD) δ ppm: 158.5, 135.6, 179.4, 163.0, 99.9, 166.2, 94.8, 159.3, 104.7, 123.5, 117.6, 145.8, 149.3, 116.5, 123.1. Luteolin 1H NMR (300 MHz, CD3OD) δ ppm: 7.43 (1H, d, J = 2 Hz), 6.68 (1H, d, J = 8.4; 1.8 Hz), 6.87 (1H, d, J = 8.4 Hz), 6.39 (1H, d, J = 2.1 Hz), 6.20 (1H, d, J = 2.1 Hz). 13C NMR (75.5 MHz, CD3OD) δ ppm: 158.5, 135.6, 179.4, 163.0, 99.9, 166.2, 94.8, 159.3, 104.7, 123.5, 117.6, 145.8, 149.3, 116.5, 123.1. Almunequin 1H NMR (300 MHz, CDCl3) δ ppm: 6.99 (1H, d, J = 1.2 Hz), 4.99 (1H, dq, J = 7.0; 1.2 Hz), 3.84 (5H, m), 3.60 (1H, m), 3.41 (2H, m), 2.25 (2H, t, J = 6.8 Hz), 2.00-1.60 (4H, m), 1.60-1.20 (m, CH2), 1.40 (3H, d, J = 6.9 Hz, CH3), 0.87 (3H, t, J = 6.8 Hz, CH3); 13C NMR (75.5 MHz, CDC13): 176.4, 148.8, 134.2, 83.2, 82.1, 81.9, 79.3, 77.3, 74.4, 72.0, 71.8, 37.3, 37.0, 35.6, 32.3, 29.5, 29.3, 29.1, 28.6, 28.34, 26.1, 25.6, 31.8, 27.3, 25.1, 22.5, 22.0, 19.1, 14.0. Fresh leaves of A. sylvatica, Trichilia silvatica, and S. terebinthifolius were subjected to steam distillation for 3 h using a Clevenger-type apparatus. The oil was dried by anhydrous sodium sulfate and preserved in a sealed vial at 4°C until analysis. Studies using liquid chromatography coupled with mass spectrometry (LC-MS) were performed using a quad MS system spectrometer (Bruker, Bremen, Germany). Mass spectrometry was carried out in positive mode, and negative ionization (ESI) was performed using a mass/charge (m/z) ratio range from 60 to 1000. The sample was analyzed on an analytical LC system (Varian) with a ternary solvent fitted with an automatic sample, a diode array detector (PDA), and a mass spectrometer (Bruker). The LC column was a Luna C-18 column (25 cm × 4.6 mm; particle size, 5 μm) (Phenomenex, Torrance, CA, USA) with a small pre-column (2.5 cm × 3 mm) containing the same filling used to protect the analytical column. The flow rate was 1.0 mL/min, and an injected volume of 10 L was used for each analysis. All liquid chromatographic analyses were performed at 22°C. The elution was conducted using a solvent gradient of 0.1% formic acid:acetonitrile (85:15, v/v); the elution required 40 min to reach 30% formic acid and 70% acetonitrile and was then returned to the initial conditions in exactly 5 min. The anti-M. tuberculosis activity of the extracts, essential oils, and compounds was determined using the REMA method. M. tuberculosis H37Rv ATCC 27294 was grown for 15 days in Middlebrook 7H9 broth (Difco) supplemented with OADC enrichment (BBL/Becton-Dickinson) containing oleic acid, albumin, dextrose, and catalase; 0.5% glycerol as a carbon source; and 0.5% Tween 80 to prevent clumping. Suspensions were prepared, and the turbidity was adjusted to a McFarland no. 1 standard. Stock solutions of the tested extracts were prepared in DMSO, and dilutions to obtain final concentrations ranging from 0.98 to 250 μg/mL were prepared in Middlebrook 7H9 broth supplemented with oleic acid, albumin, dextrose, and catalase (OADC enrichment, BBL/Becton-Dickinson, Sparks, MD, USA). Isoniazid, rifampicin, streptomycin, and ethambutol were solubilized according to the manufacturers’ recommendations (Difco Laboratories, Detroit, MI, USA) and used as positive control drugs. After further dilutions to reach the final bacterial suspension concentration (5×105 UFC/mL), 100 μL of the inoculum was added to each well of a 96-well microtiter plate containing the extracts. The assays were set up in duplicate. The plates were incubated for 7 days at 37°C, and after this incubation, 30 μL of 0.1 mg/mL resazurin was added. The wells were read for color change and fluorescence in a SPECTRAfluor Plus microfluorimeter (TECAN) (excitation/emission with 530/590 nm filters, respectively) after 24 h. The MIC (minimum inhibitory concentration) was defined as the lowest concentration resulting in a 90% growth inhibition of M. tuberculosis. The MIC values of isoniazid (0.06 μg/mL), rifampicin (0.03–0.06 μg/mL), streptomycin (0.25 μg/mL), and ethambutol (2.0–4.00 μg/mL) were determined in a single plate as standards. A sample with an MIC value < 250 μg/mL was defined as active against M. tuberculosis, and further analysis was applied. Adult female Swiss mice (19 to 24 g) from the Federal University of Grande Dourados were maintained at a controlled temperature (23°C) and humidity (50%–60%) with a constant 12 h light–dark cycle and free access to food and water. The experimental procedures were in accordance with the Ethical Principles in Animal Research and approved by the Committee for Ethics in Animal Experimentation at the Federal University of Grande Dourados (Protocol no. 005/2010). The acute toxicity studies were conducted according to OECD (Organization for Economic Cooperation and Development) Guideline 425 and ANVISA (Brazilian Health Surveillance Agency) guidelines. After 12 h of fasting, the animals were divided into four groups. The treatments were performed by single oral administration as doses of 0, 500, 1000, and 2000 mg/kg of body weight of the EAF. The animals were observed for signs of toxicity over 14 days. Behavioral parameters, mortality, the weight of the animals, and the amount of water and feed were analyzed. After 14 days of treatment, the animals were weighed and anesthetized (ketamine and xylazine, 25 and 10 mg/kg, respectively). Blood samples were collected with and without anticoagulant (heparin sodium, Cristália). The blood samples were used to determine the hematological parameters (total and differential leukocyte count, hematocrit, hemoglobin, and erythrocyte count), and the serum samples were used for biochemical analysis (aspartate aminotransferase – AST, alanine aminotransferase – ALT, gamma glutamyl transferase – γ-GT, urea, and creatinine). The biochemical parameters were determined by spectrophotometry using Gold Analisa Diagnóstica Ltda’s kits. Subsequently, the animals were euthanized, and the vital organs (lung, liver and right kidney) were removed and weighed (absolute and relative weight). For the histopathological analysis of these organs, the samples were fixed in 10% buffered formalin, and the tissues were processed by conventional techniques in 5-mm-thick paraffin slices. Slides were prepared and stained with hematoxylin and eosin for light microscopy examination. The evaluated parameters were reversible (degeneration) and irreversible (necrosis and apoptosis) cell damage, leukocyte infiltration, congestion, blood extravasation, and fibrosis. The data were evaluated using an analysis of variance with an F-test, with p < 0.05 defined as significant. The species and tested parts of the plants used in the evaluation of anti-mycobacterial activity are shown in Table 1. Of the 28 samples, only the crude extract from A. sylvatica (MIC = 184.33 μg/mL) exhibited promising activity (Table 1). Several studies and screens must be performed to develop a new drug for tuberculosis; therefore, many drug discovery studies ultimately fail. A study in Mozambique screened 75 extracts of medicinal plants used for the local treatment of symptoms related to tuberculosis and identified eight extracts with moderate to significant activity against M. tuberculosis H37Rv. Of these extracts, six showed MICs that were higher than those observed for A. sylvatica and the A. sylvatica EAF. One extract exhibited an MIC of 62 μg/mL, and another exhibited an MIC of 15 μg/mL. Another study evaluated the anti-mycobacterial activity of the crude extract of Byrsonima crassa (leaves and bark) and obtained an MIC value of 62.5 μg/mL for the chloroform extract of the leaves. The chloroform extract of the bark presented an MIC of 312.25 μg/mL. The fractionation of the extract by partitioning in different solvents provided the chloroform (CF), ethyl acetate (EAF), and hydromethanol (HMF) fractions, which were subsequently evaluated for their anti-mycobacterial activity. An evaluation of the MIC of these fractions (Table 2) revealed the potent activity of the EAF fraction, with an MIC value of 115.2 μg/mL. The result of CIM of standard drugs, used as a control to the antimycobacterial activity tests are in agreement with the expected. a:Values are means of duplicate sample. Brazilian flora is rich in plants of the family Annonaceae, which comprises approximately 120 genera and 2000–2200 species. This family is important as a source of various edible fruits and seeds that can be used for the production of edible oils. The major components identified in members of the Annonaceae are typically acetogenins[51–53]. Annona sylvatica A.St.-Hill (formerly known as Rollinia sylvatica St.-Hil. Mart) is a native Brazilian plant found in Minas Gerais and São Paulo to Rio Grande do Sul. The leaves of A. sylvatica have been used mainly as an antipyretic in folk medicine. There are no reports in the literature on the antimicrobial activity of this species, but studies have reported that the essential oil obtained from the leaves has anti-inflammatory activity and anticancer properties. A chemical study reported the isolation of sylvatin from Rollinia sylvatica. Preliminary LC-MS studies have shown that the major metabolites in the leaves of A. sylvatica are flavonoids and acetogenins (Figure 1). Chromatogram of the lyophilized extract of leaves of A. sylvatica. The results of the present study indicate that the effects of the methanolic extract of A. sylvatica and ethyl acetate fraction may be associated with other components of the extract (which were not evaluated) or that there might be a synergism between the active isolated compounds. Annonaceae acetogenins are secondary metabolites derived from polyketides and are structurally characterized by a long-chain terminal α, β-unsaturated methyl γ-lactone. This hydrocarbon chain generally contains one, two, or rarely three tetrahydrofuran (THF) rings. Acetogenins belong to two different classes: bis-tetrahydrofuran non-adjacent almunequin and dihydroalmunequin 2.5 and 2, and β-hydroxy-methyl-γ-lactone and laherrandurin otivarin. The acetogenins identified in the extract of A. sylvatica have been reported in other Annona, including A. atemoya and A. cherimola[45, 56–58]. In this context, the present study revealed the potential anti-M. tuberculosis activity of the methanolic extract of A. sylvatica, which is still poorly characterized in phytochemical and pharmacological terms. To characterize the possible compounds responsible for this activity, we investigated the individual compounds in the methanolic extract of A. sylvatica; our chromatogram of the lyophilized extract (Figure 1) showed characteristic distributions of the flavonoids luteolin (m/z 286) (1) and quercetin (m/z 302) (2) and the acetogenins laherrandurin (m/z 624) (3), almunequin (m/z 638) (4), otivarin (m/z 640) (5), and 2,5 dihydroalmunequin (m/z 640) (6) (Figure 1). This is the first report of the chemical characterization of compounds from A. sylvatica leaves. The isolated compounds evaluated for anti-mycobacterial activity are shown in Table 2. In the present study, we examined the effects of two flavonoids: luteolin and quercetin. Among the isolated compounds, luteolin and almunequin showed anti-M. tuberculosis effects, with MIC values of 236.8 μg/mL (827.28 μM) and 209.9 μg/mL (328.48 μM), respectively. Our data indicate that quercetin, unlike luteolin and almunequin, failed to exhibit anti-mycobacterial activity at low concentrations. Luteolin isolated from the flowers of Chromolaena odorata showed weak activity (699.3 μM MIC) against M. tuberculosis. However, luteolin isolated from Ficus chlamydocarpa showed stronger activity against M. tuberculosis and M. smegmatis (78.12 μg/mL MIC). Nevertheless, the luteolin isolated from the whole plant of Gentianopsis paludosa was inactive against these microorganisms. Having established the inhibitory effects of luteolin on M. tuberculosis, we investigated whether this agent exhibits a structure-activity relationship in terms of its biological function. The isolated flavonoids belong to the flavone (luteolin) and flavon-3-ol (quercetin) classes. The structures of quercetin and luteolin share double bonds between C2 and C3 in ring C, the 3’, 4’ -diOH ring A groups, and the 7, 8 -diOH ring A groups. However, ring C in these compounds shows considerable variation, as it is a 3-OH group in quercetin. This variation shows that catechol groups could not confer appreciable activity when they were found on both ring A and ring B. From a structural point of view, this finding suggests that the 3-OH in quercetin results in an inactivation of the structure, which might be critical for M. tuberculosis survival. The observed results for quercetin are consistent with those observed for quercetin isolated from Helichrysum melanacme against M. tuberculosis. Based on our data and those of others, we suggest that the absence of hydroxylation in the C3 in structure of the luteolin is required for anti-mycobacterial activity. These results may provide a basis for the further design of new anti-mycobacterial drugs. The compound almunequin was very difficult to isolate. Almunequin is a C37 annonaceous acetogenin with a bis-tetrahydrofuranic structure containing hydroxyl groups and α, β-unsaturated γ-lactone methyl group. The structure-activity relationship for almunequin can be attributed the α, β-unsaturated lactone present at the long-chain terminal. The α, β-unsaturated lactones are a class of synthetic and naturally occurring compounds that exhibit a large spectrum of important pharmacological properties[34–38, 59]. The EAF fraction of A. sylvatica produced significant weight gain in treated animals (Table 3). During treatment, no clinical signs of toxicity were observed, and no death was recorded. There were also no changes in food or water intake. The oral administration of this fraction generally did not produce toxic effects on the behavior of adult female Swiss mice. Apart from the weight increase, no visible clinical signs of toxicity were observed. Relative weight (%) of the liver, lung, heart, right kidney, left kidney and spleen of female Swiss mice treated with 500, 1000 and 2000 mg kg-1 of the EAF fraction of A. sylvatica. Data are expressed as the mean ± standard deviation SISVAR 5.3. (n=6) is the number of animals in each group. p*=5%. There was no evidence for differences in physiological or behavioral responses between the control group and any of the treated groups at any time. There were also no differences in the consumption of food and water. The hematologic parameters of the treated groups did not differ from those of the control group. A biochemical evaluation confirmed these results; there were no significant differences in the AST, ALT, or γ GT results between the control group and treated animals. These enzymes are liver function markers, and changes in these parameters may result from reversible or irreversible hepatocellular membrane damage. Changes in these markers are often associated with necrosis, cholestasis, hypoxia, hypoperfusion, inflammation, infectious agents and toxins, or excess lipid or glycogen deposition in hepatocytes. The integrity of liver function was assessed by histopathological analysis of the liver, and we found no damage associated with hepatotoxicity. The effects of the acute administration of the EAF fraction of A. sylvatica on hematological and biochemical parameters are presented in Table 4. Hematological and biochemical parameters of female Swiss mice treated acutely orally with vehicle (control) or the EAF fraction of A. sylvatica at doses of 500 mg kg-1 1000 mg kg-1 and 2000 mg kg-1 Values represent the mean ± SD. (n=6) is the number of animals in each group. p*=5%. γ GT = Gamma glutamyl transferase. The EAF fraction of A. sylvatica had no acute toxicity, as evidenced by the absence of relevant clinical signs in the toxicological screening and the absence of death throughout the observation period. Hippocratic screening such as this is often used for the preliminary screening of plants for toxicological and pharmacological activity. The EAF fraction also did not have any influence on the consciousness of the animals during the observed period. No effects on the motor coordination or reflexes of the treated animals were observed. 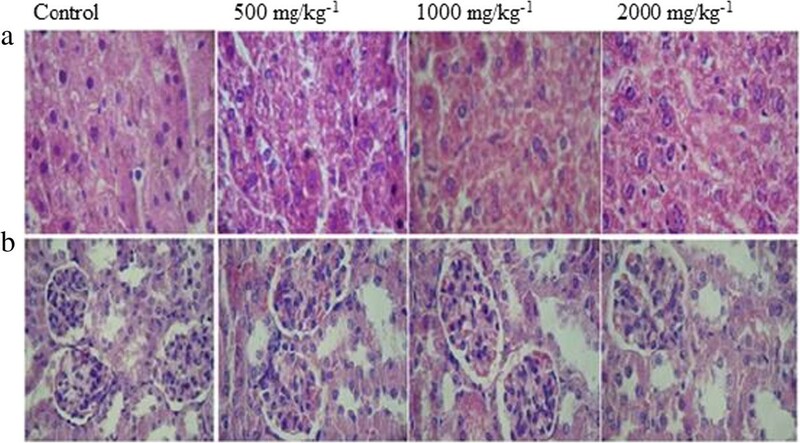 At doses of 500, 1000, and 2000 mg/kg, the EAF fraction produced no dose-dependent changes in histopathology between the control group and the treated animals (Figure 2). Therefore, EAF has low toxicity at high doses in the short term. Additional studies are required to determine the safety of this fraction over a prolonged period. Histological analysis of acute toxicity at doses of 500, 1000 and 2000 mg/kg -1 of EAF fraction (hematoxylin – eosin staining, 100X magnification). a) Longitudinal section of liver; b) longitudinal section of kidney. The acute administration of the EAF produced no toxic effects in adult female Swiss mice. No visible clinical signs of toxicity, such as irritability, twisting, righting reflex, tremors, convulsions, breathing, weight loss, or death, were observed. In the present study, we did not observe an increase in the accumulation of urea or creatinine. These results were also confirmed by histopathological analysis of the kidneys, which indicates that the acute oral administration of A. sylvatica does not induce nephrotoxicity. These field studies did not involve endangered or protected species and no specific permits were required for the described studies. The studies performed with species of Annonaceae, Bignonaceae, Meliaceae, Fabaceae and Myrcia species were collected in particular area, with access permitted the researchers to collect botanical material. The species of Asteraceae, Anacardiaceae, Tropaeolaceae and Malvaceae were collected in the Medicinal Plants Garden of the Federal University of Grande Dourados, and Gesneriaceae in the Municipal Botanical Museum of Curitiba. The Rubiaceae were collected in a Brazilian stretch of the Upper Paraná River, Porto Rico, park ecosystem components collection for scientific purposes. The work with Sinningia species had an access authorization to genetic patrimony given by National Research Council (CNPq, 010087/2012-5). Professor Armando C. Cervi (Federal University of Paraná) collected S. aggregata and S. canescens, and Clarice Bolfe Poliquesi (Municipal Botanical Museum of Curitiba) collected Sinningia allagophylla. To the best of our knowledge, this is the first chemical characterization, evaluation of antitubercular activity, and analysis of the in vivo acute toxicity of the A. sylvatica methanolic extract. Our study demonstrates the potential anti-mycobacterial activity and the lack of in vivo acute toxicity of its isolated compounds. We are grateful to CNPq for providing financial support (564506/2010-9). In addition, we are grateful to Dr. Maria Conceição de Souza, Dr. Zefa Valdevina Pereira, and Dr. Armando Carlos Cervi for the botanical identification of plant material. RCP and VVS performed the experimental work and data analyses of the antimycobacterial activity tests and the in vivo acute toxicity tests, respectively, and wrote the manuscript. JC designed the study and FRP supervised experimental work. CALK and ASNF performed the plant extractions and LC-MS and NMR experimental work. JC, FRP, FARN e MEAS have reviewed the manuscript. All authors read and approved the final manuscript.